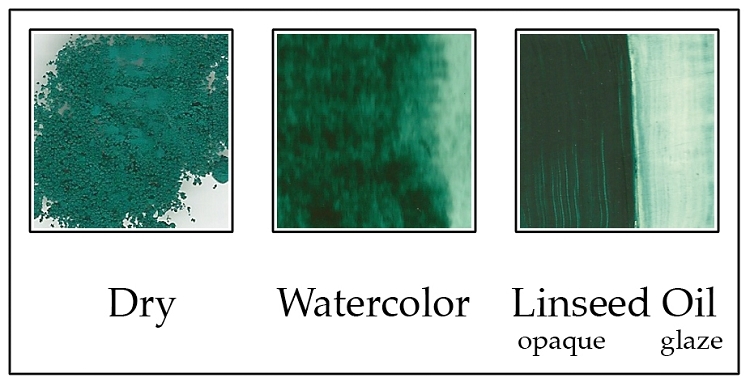 Genuine Mayan Green Pigment. This rich green shade is suitable for all media and is lime/plaster and concrete proof. Was this answer helpful? 6 of 7 Customer(s) found this Answer helpful. Q: Does this pigment mix readily with water to form a paste,or does it take some effort like the thalos? A: Yes, this pigment mixes more readily into water than an organic manufactured pigment, such as phthalo blue or hansa yellow. Q: Is this pigment vegetable based or mineral? Is it related to mayan blue? A: Yes, this pigment is made the same way the Mayan Blue pigment is made. It is a natural dye that has been precipitated onto a diatomaceous earth particle. So it is both vegetable dye and mineral based. A: Even though the ingredients are all natural in this pigment, it would not be suitable for soap making. What you need are cosmetic grade pigments which have been tested for use on skin. None of our pigments have that certification. Q: is this a water based paint , or can I use it as an oil paint in painting on canvas as an artist colour ? A: All Mayan Pigments can be used in water based and oil based paints.